Welcome to my web site. I'm Jeff Pockat, a self taught Celtic harp (Gaelic harp) musician and composer. The music is performed on the Ancient Wire Strung Celtic Harp. These are traditional and original pieces that soothe the mind, soul, body, and spirit. They are available for purchase on compact disks (CDs) and audio cassettes, or download sample tracks. I am also available for hire, to provide live music for your gathering. Please read my Resume. 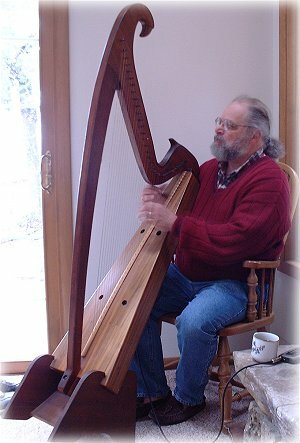 Various historic names of my instrument: Gaelic harp, Celtic harp, clarsach, clairseach. Web design copyright 2003-2004 by Jeff Pockat and M.L. Arnoldussen. All rights reserved.